Godfrey Kiwanda Ssuubi State Minister for Tourism defended his curvy women project arguing that it’s intended to attract the attention of people. In an interview on next radio, Kiwanda says using girls in his tourism projects is to attract the attention of the tourists. Kiwanda has been using beauty queen socialites like Zari Hassan, followed by Quiin Abenakyo and currently Anita Fabiola in his attempt to boost Tourism which has raised public concern. Kiwanda insists that he will continue using women in his tourism projects until it’s talked about by every person in this country. Adding that it’s not different from other pageants being held. Minister Kiwanda was also asked to explain the logic behind the photos which went viral showing him with Fabiola in the ‘Tulambule’ project. But he said some of the photos were a result of Photoshop, noting that he was not admiring Fabiola’s curvy looks as indicated. Kiwanda in a question directed to him on how his wife takes it, after seeing him with these beauties his answer was his wife understands his job outline. 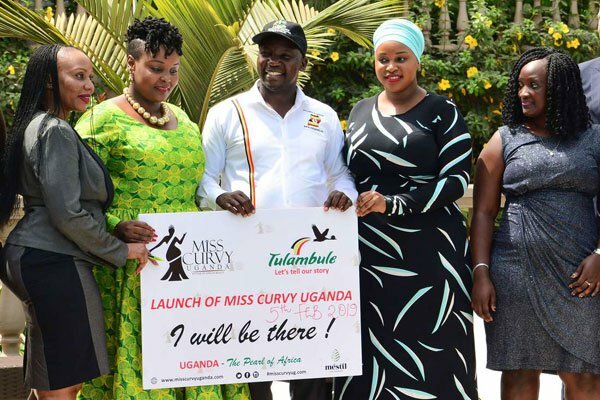 Kiwanda is expected to address parliament on matters concerning miss curvy project, which he says has been mistaken by Ugandans. This followed an attack by Minister of Ethics and integrity Sam Lokodo accusing him of promoting immorality.